Champagne Chandelier is the last word in aerial decadence. It is the largest crystal hung chandelier, fully lit with controllable colour changing LED lights from which aerial can be performed. It is unique in its design and size, it is truly a stunning bespoke creation. This is the perfect centre piece at corporate events, weddings and everything in between! A beautiful costumed female aerial performer elegantly turns and rotates underneath, serving your guests with champagne from the air. 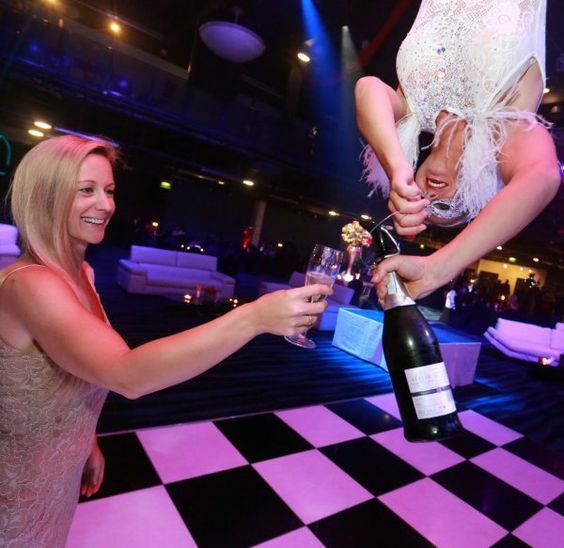 The Champagne Chandelier rises and lowers for maximum impact, allowing the performer to somersault high above guest’s heads and low enough to serve champagne at a perfect height. The bespoke design allows for up to 8 bottles to hang under the chandelier, without losing their bubbles. Champagne Chandelier is perfect for dazzling at a wide range of events and sets off an event space to perfection, even when it’s not part of the performance. The feature performance is our dynamic male and female aerial duo hoop act. This can be performed with or without our beautiful Feather showgirls and led feather fans. Together the production of dancers, acrobalance, beautiful aerial skills and gorgeous chorography, we bring you a fabulous new way to stun and amaze your guests. 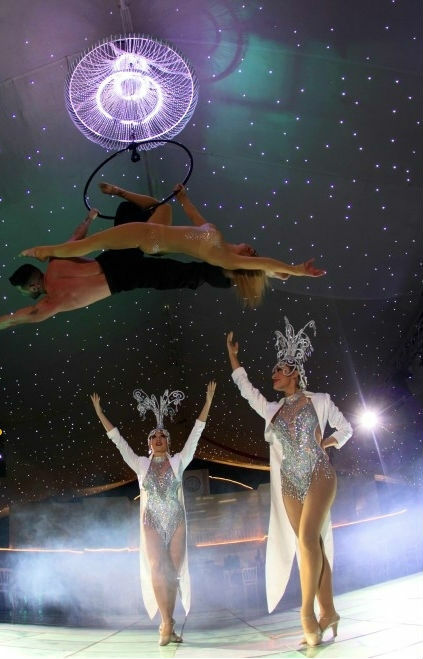 We have many in house acts that will complement our Champagne chandelier such as chandelier canapé hostess and living tables, stunning stilt walkers and living statues, bubble sphere acts, fire shows, dancers and more, so please feel free to ask for additional acts to create your bespoke production. Aerial Bartending -2 x 30 minutes or 3 x 20 minutes with break of 10 minutes between sets. Aerial hoop performance 5 – 8 minutes dependent on routine.